A lot more is being recorded, nowadays; we have the technology for it, after all. Audiobooks, podcasts, songs, lecture/seminar recordings, you name it, it’s being done. Often while we are listening to a recording (especially those of an academic nature), we are struck by a need to note something at a certain point in the recording…usually done by hand, which is kind of a pain. Well, DreamTimeStudioZ has released an “ultimate memory app” called HearMarkZ to create audio bookmarks, audio notes, and more! The developers break down HearMarkZ’s usage into three main points: capture, contextualize, and connect. To capture, upload one of your audio files–be it audiobook or podcast, etc.–by tapping Add New FileZ. The file will begin playing, and once you hit a spot you want to make note of, tap the paperclip icon on the bottom toolbar. The app will make a bookmark (HearMarkZ) of it, and you can add a Text Notez to it by tapping the blue arrow next to the bookmark; if you want to add an Audio NoteZ (be sure to have a recording device attached), tap the microphone icon: contextualizing in action. 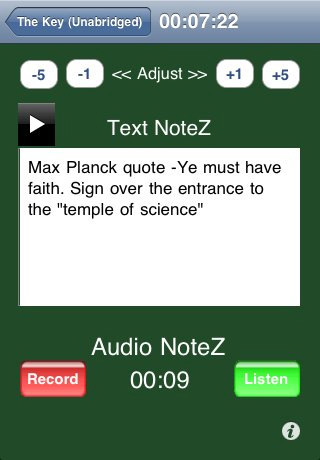 You can add notes, text and audio, at any time; tapping on each HearMarkZ will start the track at the point you marked. The last icon on the home page, ReZume, will play the last file you were listening to if you’re interrupted by a call, text, or push notification. HearMarkZ makes it easy to connect with other users, as long as you have internet connection. There is an Real Time Tweet option that you can turn on, which will tweet every time you make a HearMarkZ (or you can use the Share icon while on the FileZ page). Using the Share icon will also allow you to share your file on the public HearMarkZ.Net CollectionZ Library If you find something of interest while visiting the CollectionZ Library, you can download it by tapping the cloud icon. Another feature is the ability to download from another device running HearMarkZ via wifi; just be sure you are both accessing the same wifi, and enter the IP address on the download screen. This ultimate memory app certainly comes chock-full of neat features, many that would be extremely helpful to those who listen to recordings for business. For example, many students now record lectures on their laptops; now they can pause and make notes while reviewing these recordings. HearMarkZ makes the need for pen and paper obsolete (it certainly is a sight safer to use while driving), and the sharing function is useful for group study sessions or projects. It’s a bit pricey at $6.99, but worth the price tag if you’re a heavy podcast/audiobook user that likes to note-take. AppSafari review of HearMarkZ was written by Julie Guan on May 21st, 2010 and categorized under App Store, Books, Education, Music, Podcasts, Productivity, Shareware. Page viewed 3493 times, 1 so far today. Need help on using these apps? Please read the Help Page.